Early published series of laparoscopic live donor nephrectomies cited aggressive dissection of periureteral tissues to expose and identify the ureter as the main factor in a high incidence of ureteral complications, including ureteral stricture and necrosis (6,9). To avoid this, dissection is carried out medial to the distal gonadal vein stump, bluntly sweeping this structure and the periureteral tissues in a lateral direction. The medial attachments of the gonadal vein can be controlled with the harmonic scalpel, because small tributaries may cause minor bleeding. 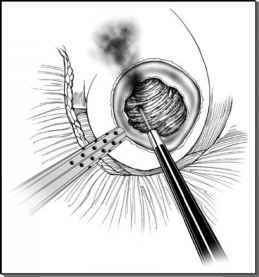 However, thermal energy should be used carefully to prevent thermal injury to the ureter or its blood supply. In our current technique, one instrument is placed under the ureteral packet (including the gonadal vein) and elevated anteriorly (Fig. 8). The other instrument bluntly dissects the posterior attachments back to the fascia overlying the psoas muscle. Dissection is carried to the lateral abdominal sidewall and continued inferiorly to the iliac vessels. Limited dissection is performed between the renal artery and the proximal ureter, thereby maintaining the ureteral blood supply arising from the renal artery. At this point in the procedure, the ureter is left intact. It will not be divided until the kidney is ready for extraction.